Lynden Air Cargo was singled out for praise earlier this year by Alaska Airlines CEO Brad Tilden for its quick response in Cordova, AK. “We were asked to fly from Anchorage to Seattle and pick up two engines to take to Cordova for one of their aircrafts that had experienced maintenance issues,” explains Jim Davis, Director of Marketing & Traffic for Lynden Air Cargo. “We headed out of Anchorage, got into Seattle about 2 a.m., departed at 4 a.m. and delivered the engines to an Alaska Airlines maintenance crew that was standing by in Cordova. Two days later we made a second night flight to retrieve the engines they had removed and take them back down to their maintenance base in Anchorage. 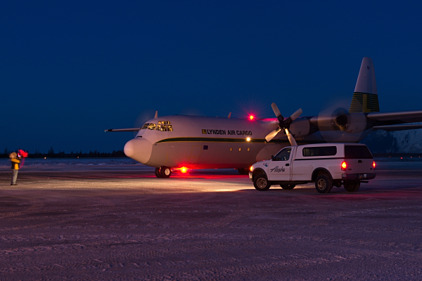 It’s always nice to get positive feedback about our performance.” Lynden’s Hercules is shown making a night delivery in the photo above.